I have been a cheese lover since I was a child but one cheese that I was grossed out by was pimento cheese. I remember platters of sandwiches packed with a strange yellow filling with little red things in it. Weird. When I grew older, I experienced those sandwiches being more open-minded. 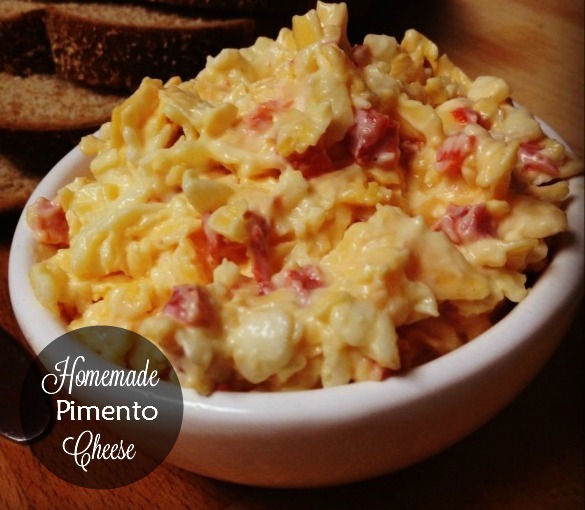 I became a lover of homemade Pimento cheese made the Southern way. Serve on toast, as a sandwich, on crackers as a dip or enjoy by the spoonful. Place the Cheddar cheese, cream cheese, mayonnaise, garlic powder, onion powder, mustard and pimento into the large bowl of a mixer. Beat at medium speed, with paddle if possible, until thoroughly combined. Season to taste with salt and black pepper. Cook’s Note: You can add other seasonings as well–a hint of cayenne, pickled jalapenos, or perhaps spiced pecans.